Ananya is delighted to be partnering with world-renowned floral designer Karen Tran, as she visits London this month for three days of luxury foral masterclasses. The visit concludes with an invitation-only gala dinner. Taking place at The Savoy on Thursday 18th April, the theme of the dinner is ‘Opulence at The Savoy’, masterminded by luxury wedding planner Jane Riddell from Planned to Perfection, in association with cake designer Elizabeth’s Cake Emporium, Karen Tran’s UK support florist WildAbout, and supported by The Function Band. Ananya was commissioned to create a bespoke stationery suite fitting for such an extravaganza. We created digital save the dates to set the tone for what was to come. This was followed by hand crafting 100 delicate paper roses, demonstrating our exquisite craftsmanship and attention to detail. “Roses are timelessly elegant and embody the universal language of love. Using ivory paper introduces a symbolic gesture towards both opulence and virtue,” explains Vaishali Shah, Founder and Creative Director of Ananya. We wanted to use a floral theme to celebrate Karen Tran’s floral creativity. “We adore the three-dimensional effect the paper rose creates, which we believe will be a key trend for 2019 and 2020 weddings. It was important to us that guests be able to keep their roses after the event, so we added a ribbon loop to help make the rose an everlasting keepsake”. The paper rose is echoed in the invitations and menus, which showcase hand-drawn illustrations. Always eager to find new and creative ways to add detail to our stationery, every invitation is scented with floral notes of peony, lily and jasmine before being tied to the paper rose, and completed with a handwritten, personalised gold calligraphy tag. Flashes of gold, which feature throughout the suite, complement the event’s ‘Opulence at The Savoy’ theme and the colour palette of the venue. 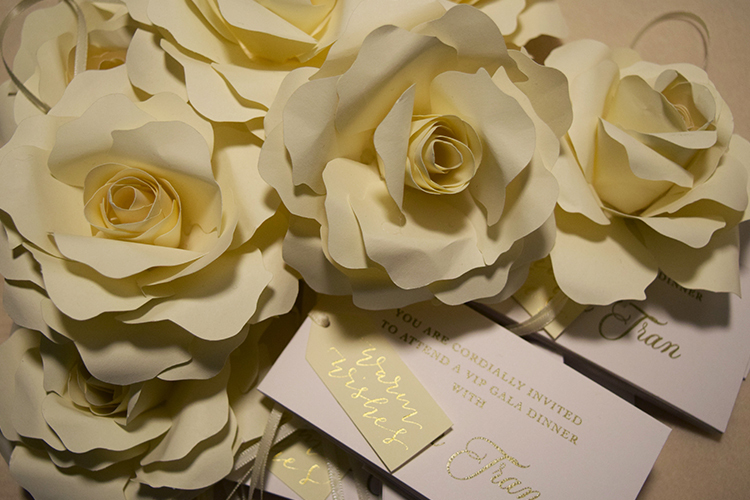 On the day, guests will be able to see more opulent paper goods created by the Ananya team, including place cards, table stationery and an abundance of romantic paper roses. To discuss how we can create stationery for your event, please get in touch with us now.